Makerbot's new 3D printer, The Replicator, improves upon their previous 3D printer, The Thing-o-matic, in a number of areas. Like the Thing-o-matic, the Replicator prints objects in plastic, but the Replicator has a larger print area, approximately the size of a loaf of bread. That equates to a printing volume of up to about 5 litres, making The Replicator perhaps the biggest consumer-level printer available, and with a capacity more than enough for most household projects. The Replicator incorporates a second extruding head, allowing users to print objects in a combination of 2 colours. The new built-in control system prevents software crashes shutting down the printer. 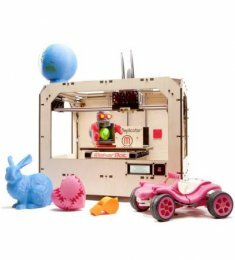 The Makerbot Replicator initially retails at $1,749.00 for a single extruder model and $1,999.00 for a dual extrusion model.